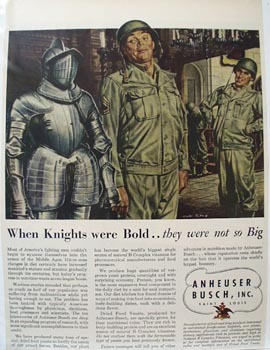 Anheuser Busch When Knights were Bold Ad 1945 This is a July 9, 1945 advertisement. It is a nice color ad from Anheuser Busch, Inc of Saint Louis. Pictures two service men standing beside a Knight and they are bigger than the knight It reads, When Knights were bold, they were not so big. In mint condition. This photo is taken through plastic and may show wrinkles or crookedness that is not in the ad. This magazine tear sheet measures 9 3/4"" wide by 13 1/2"" tall. Items Similar To "Anheuser Busch When Knights were Bold Ad 1945"